FYI: Board repair guy in Richmond. Maybe he'll do Deep tuttle installs. Has anyone dealt with these guys???? Its around $120 US to ship. Name brand stuff is starting to come up used for reasonable prices. Heck I couldn't sell my slingshot for $800 a few months after I bought it. So I'm thinking in a year or so the swaps will start to get good. FYI I think you'd need to build a longer fuselage for that foil. 1. Naish Hover Titan 120. Addition of 2 US Fin Box for a foil. Rider is flying using a 5.8m Sprint and no whitecaps. 2. The guy hit a fish with his fin, seems like the fin box survived! The impact stress traveled to the weakest part of the board. 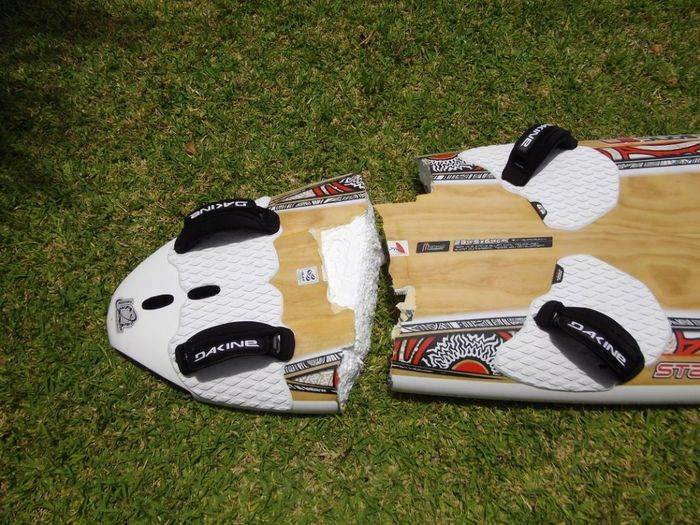 Makes you wonder about first gen foil ready boards, the fin box is rock solid but is the rest of the board solid enough. That's an area which gets soft on lots of slalom boards, maybe it was just tired? I've had at least one pretty significant grounding (in mud thankfully) and my board shows no sign of buckling, neither does my new fin box. http://godsbeach.org He's at his beach. Different Hydrofoil design. Goes okay in a straight line. He hit a crab cage and ripped up the foil off his board at 2:36. Apparently Carbon floats. Fuselage drag is minimal compared to two masts. I bet it turns like a truck.